The Importance of a Quick Reply. Customers expect instant engagement on social media. Is your brand ready to take the real-time plunge? By now, much has been said about customer service on social. The bottom line: It’s a must. If you are not already in the game, hurry up, because there’s a lot of catching up to do. Your customers are looking for you on social – and if you are not there to fulfill their needs, they won’t hesitate to switch over to the best alternative. With the metamorphosis of social media into a customer service channel, where fans can directly and publicly communicate any issue with brands, the expectations of reply have changed drastically from the days of phone and email. According to The Social Habit and Jay Baer, 32% of users who have ever interacted with a brand on social expect a reply in 30 minutes or less. Further, 42% expect a response within 60 minutes. Staggering stats for brands – we are no longer playing the game of to be or not to be on social. The power has now shifted to the consumers and we, as brands, must keep up with their expectations. However, it’s not just brands that need to satisfy customer expectations. All social networks have to constantly innovate and make sure that users have the technology to communicate as effortlessly as they were talking to friends, and these days…instantly. Social media sites such as Facebook and Twitter are continuously working towards becoming the networks of choice for customers looking to interact with brands. With their latest developments and announcements, it is clear to see that customer care is central to their future operations. At the same time, we can easily notice that communication on social as we know it is changing. With capabilities such as Live streaming, video, and social monitoring, engagement is becoming real-time and it is safe to predict that the current norm of a 30-minute wait for a reply will drastically decrease, pushing brands to become even more agile, reactive and creative in their ways of using technology. What can we expect from Twitter and Facebook? Twitter recently announced two features that will have a substantial impact on its usage as a customer service platform. Firstly, its core 140 character limit will no longer include photos and mentions, allowing both companies and users more space for sharing their comments, enabling more informative and meaningful conversations. However, the most important update concerns the future tweet format: tweets that start with a handle will no longer be considered replies. Marketers have been waiting for this feature for a long time, anxious to stop using the visually unappealing “[email protected]“ format. Previously all tweets starting with a handle would be considered replies and would be visible to the sender, recipient, and any shared friends. Now all mentions will be public – so the importance of a quick and comprehensive reply is heightened. All interactions will be available for anyone to see, intervene, and share further (and all marketers tremble in fear). Facebook has always been another popular choice for users to communicate with brands. And it is not setting for second place. With Messenger becoming a fully independent app from Facebook, and users having specific network names and codes unifying offline and online customer service, it is clear that Facebook sees customer service as a major focus. In other words, as it looks right now, Messenger is to become the ultimate tool for 1:1 engagement, be it user-to-user, or user-to-brand. With public response times, Facebook is also nudging marketers towards their Facebook pages, prompting them to deliver fast replies and keep a vigilant eye on what’s happening on their pages. With the new Messenger codes, fans can connect with brands instantly. Scan our code if you would like to contact us. Can your brand stay in the game? According to the same study conducted by Jay Baer and The Social Habit “57% of users interviewed in the study expect the same response time at night and on weekends as during normal business hours.” Brands need to be aware that customers don’t consider the time of day, day of the week, or even holidays. They want an answer and they want it now. What can you do to meet their expectations? #1 – Assess your current reply rate and time – can they be improved? Facebook shows you this on your brand page. However, for all the other networks, it is good to have the right tool in place that will give you accurate results. 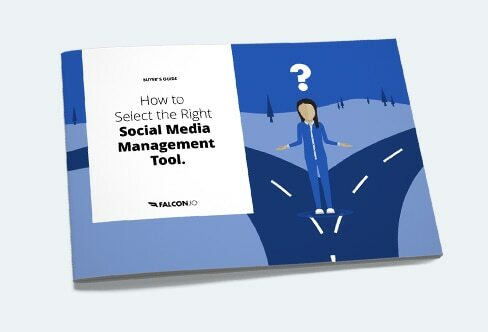 #2 – Decide together with your employees what can be done to improve these results – and revise these aspects on a constant basis to keep up with the latest developments in social media. For example, you can set up template replies, in various formats depending on network, that can quickly be accessed by your social customer care team. In Falcon you can easily set up templates to ensure cohesive communication across teams, and decrease response time. #3 – Create an escalation process – depending on the questions you receive, some of your employees in other departments might be able to offer a better response. It could be helpful for your business to think of key people that can quickly step in and offer satisfactory replies. #5 – Set up scenarios and workflows in place for the possibility of a difficult situation or a crisis. You may not be able to fully predict what situation may arise, but your policy should guide your employees, at least on a high-level. With new features being announced every week by the main social networks, it is clear to see why some companies might have issues keeping up. Lack of manpower, budget, or social media adoption can be influencing factors. However, smart marketers can recognize the opportunities that lie behind these developments. Social networks are making customer care an option for every brand – small, medium, or large – around the world. There are no excuses left for not engaging with your customers in the moments that matter along their buyer journey. Your customers are waiting – will you be there to meet their expectations?